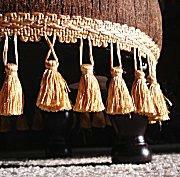 Using tassels can create many decorative moods for different projects. Tassels can offer a splash of elegance, a hint of flirtation, or just a quick bit of color. Choosing which embellishments are most appropriate and how to use them, however, is the key to a fabulous look. Tassels have been used to symbolize rank, status, and luxury for centuries. Both military officials and religious sects have used these flowing embellishments, whether attached to clothing, uniforms, or other important objects associated with rank and status. Tassels have also served practical purposes over the years, such as distinguishing a key and helping keep small items from becoming lost. Even today, tassels are used for status, the most prominent example of which is the graduation tassel attached to a mortar board. In sixteenth century France, a formal guild for passementerie was formed; a group of artisans specializing in tassels and trimmings as artwork. These elaborate embellishments may have taken weeks or months to create from the finest materials. Today, more elaborate tassels are sought-after as design elements. Yet whether you choose a simple, fun design or an elegant, artistic piece, using tassels as embellishments has a rich history and a myriad of possible applications. Cut tassels: These tassels have each thread in the skirt cut for a loose, flowing effect. 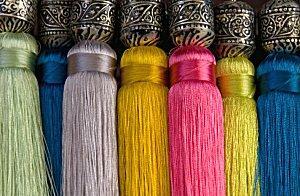 Bullion tassels: These embellishments have looped or twisted ends and threads are not cut. Combination tassels: For durability, some designs use bullion cores with cut edges. This gives a tassel volume, but also controls tangling more effectively. Molded tassels: The "mold" is the wrapped head of a tassel. The most familiar designs simply use the same threads or materials that form the skirt, while others may have a wooden or porcelain head that secures the skirt. Beyond these general classifications, tassels come in an extraordinary range of sizes, colors, and materials. The key to using tassels for various projects is to know how to match the accent to the overall project. The types of materials used in the overall project. A fine silk tassel will not match a chunky, denim floor pillow, while a bulky yarn tassel may not be the best choice to use as a tie-back for suede drapes. The durability of the tassel. If the tassel will be touched, moved, or manipulated frequently (zipper pulls, for example), it should be made of materials that have less tendency to twist or tangle. The tassel size versus the project size. A thick, long tassel will overpower a small silk ring-bearer pillow, while a solitary tiny beaded tassel will not be noticed accenting a bed canopy. While tassels are delightful accents to a wide range of projects, the most important thing to remember about using them is to exercise moderation. A single tassel makes a bold statement, but too many can seem ostentatious. In general, in addition to balancing the tassel with the project at hand, also consider the overall design scheme. The more tassels that are used, the simpler they should be to add up to a similar "total" of tassel-ness. Tassels come in a tremendous range of styles, from silk threads to chenille cord, beads, ribbons, raffia, rickrack, and yarn. These delightful accents have a similarly wide range of uses, with possibilities for tassel accents in every room of the home. When using tassels, don't be afraid to experiment with new materials and new accents, and it is easy to find the perfect tassel to suit every style and taste..